I seem to come across some amazing new writers courtesy Netgalley and Olivia Miles sure caught my attention. There is no doubt I can be very picky about the books I read considering I’ m a voracious reader thrice over!!! 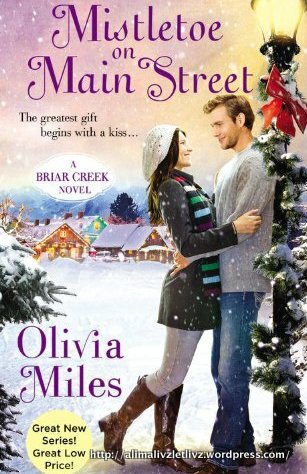 I’ve never read Olivia Miles before “Mistletoe On Main Street”, a first in her new “Briar Creek Series”. Set in Briar Creek with its quaint stores, charming people and friendly neighbors, “Mistletoe On Main Street” kick starts the series with Grace Madison and Luke Hastings finding their way back to each other in the season of snow, sleigh bells and mistletoes. Grace Madison is writer coming back to her hometown after her father passes away. Past pain and hurt have kept her away from her family and a love, that was never meant to be or so she thought. Finding herself at a lose end with things in the city gone awry, coming back to Briar Creek seems to be the means to an end as to what her next phase of life would be. Luke Hastings is a teacher and he once upon a time loved Grace, before she flew away to spread her wings. Her arrival hack into their hometown, dredges up feelings that have been dormant, and her presence seems to stoke those embers into something more. A recent widower, Luke is at a crossroads between his feelings for Grace, and guilt for what has been the outcome of his only marriage. As Grace and Luke try to put a closure to the separation of the past, the guilt and anguish of the past doesn’t seem to make the future any more viable. I loved the way Olivia gave so much more importance to the feelings and torment that Grace and Luke go through. Even as they explore the attraction and come together, their future, their goals and their insecurities always seem to dog them into not to make a commitment. The questions that Luke asks himself, the self talks he gives himself, was an emotional read as a normal tries to get cross over a past that feels he’s never done justice to. And Grace with her inner strength and focus, and a vision to make a future attainable, puts in her full force of tenacity to make things work. Under the winter skies, on the streets twinkling with starry lights and mistletoes, among the warm people humming Christmas carols and baking ginger bread cookies, Olivia Miles writes a beautiful love story for Grace and Luke. She is on my list for a definite repeat reads and I am looking forward to Anna Madison and Mark Hastings firing up the streets of Briar Creek in her next, “Match Made On Main Street”.